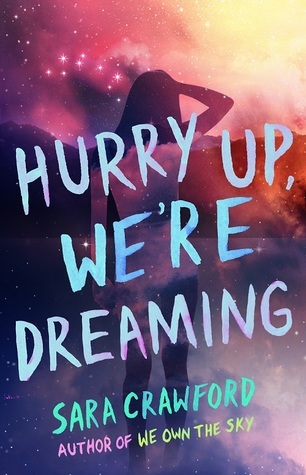 Hurry Up, We’re Dreaming is the sequel to Sara Crawford’s We Own the Sky which was published earlier this year. I reviewed We Own the Sky so if you haven’t read that book maybe go check out my review because there will be spoilers for it in this review. I did receive a free copy of this book from the author but this in no way impacted my opinions of the book. Sylvia Baker used to live for music: constantly listening to artists like M83 and Moonlight Bride, writing songs, and playing drums in a band. But now, the soundtrack of her life is silence. If she lets the music back in, she’s worried she will return to her delusions about the Muses–the mystical beings who inspire artists to create art. She’s worried she’ll have to face the wounds of losing Vincent, her Muse, her love. She tries to move on, immersing herself in the real world–working at the grocery store, mending her relationships with her friends and her father, and developing a new love for hiking. But in her dreams, she is forced to face the questions growing in her heart. What if they never were delusions? What if a vicious battle between the traditional Greek Muses and modern Earthly Muses tore her from the world of the Muses? What if she never lost Vincent at all? And what if he’s the one who needs to be saved? This book was kind of meh to me. And beware that urban fantasy/romance isn’t usually a genre I enjoy so that might be affecting my perspectives of this book. I feel like it suffered from second book syndrome in that the excitement of the first book had worn off and this book was just spent setting up for the last book in the trilogy. I do like where the series appears to be going though. The next book should be full of high energy scenes. I loved the development in Sylvia’s relationships to people at her school. There was a lot of growth there and considering there weren’t a lot of high action scenes and the book was more about her growth as a person these relationships were really nice to see. I found the scenes focusing on what was going on in the muse world a bit boring, specifically the ones about Mercedes. She felt kind of flat to me as a character and I didn’t care enough about her to be engrossed in her plot line. The diversity incorporated in this book was nice to see because the tone of this book didn’t really require it (if that makes sense?). This series could so easily have had no diversity and only one or two minor plot points would have been changed, so it was awesome to see characters who had other narrative purposes just happen to provide some diversity. Sylvia remained someone I couldn’t personally relate to but who has a lot in common with some of my friends. This meant I viewed her decisions a bit more critically because I could see the flaws in them, as opposed to being a bit blind to my own flaws. Although I have to say that since reading the first book music has become more important to me so I can relate a bit more in that way. I loved seeing her with a few more friends because in the previous book she’d been quite closed off. I loved the female friendships in this book so much and it was good to see each of the teens grow a bit. I remain ambivalent about Vincent. He still didn’t have a lot of character traits and felt more like the stereotypical “perfect boyfriend”. The relationship between Sylvia and her dad grew a lot and that was amazing to see. He was a lot more present in this book than the previous one. This book answered a few of my world building questions from the previous book in the series, such as can artists make good art on their own or do they need a muse (answer: they can) and are some muses better at inspiring than others (answer: it appears so? but not 100% confirmed). Other than that there wasn’t a whole lot of world building that was necessary for this book, but the world felt real and believable and I enjoyed the little nods to other parts of greek mythology. This book, like the one before it, was a lot more focused on the characters development. It didn’t have a very strong driving plot, and I feel like this is common for books with real world elements. I liked how we got to see the characters grow. I found the plot of the muse’s world quite boring if I’m honest. I had never grown attached to those characters so I couldn’t bring myself to care about what they were doing.